Lightning Training Solutions are a training provider delivering first aid courses in the UK. The importance of having qualified individuals capable of administering First Aid in the workplace is recognised by employers. Once first aiders have attended the course, they will be able to provide basic care and help to injured people before professional assistance arrives. The courses are designed to give first aiders the confidence to perform basic life support, treat burns, cuts, fractures and eye injuries and have an understanding of the legal requirements and composition of first aid boxes. Courses can be adapted to suit types of work place and can be arranged over a number of weeks or non-consecutive days should this be necessary to suit your working day. We can provide training at any time during a 24-hour day and on any day of the week if required. Why Is First Aid in the Work Place Important? First Aid knowledge is invaluable for both you as the individual and for your community. It enables you to assist persons who become injured in the event of an accident or an emergency situation until help arrives. First Aid skills can be applied in the home, the workplace or in public locations, therefore the more First Aid certified people there are in a community the safer that community becomes. There are four main benefits of making first aid training a requirement in the workplace. First aid programs allow your company to tailor training to your workplace, current risk management strategy, financial capability, and industry in which you operate. For example, a first aid program for a large office will differ from a program for a construction firm. 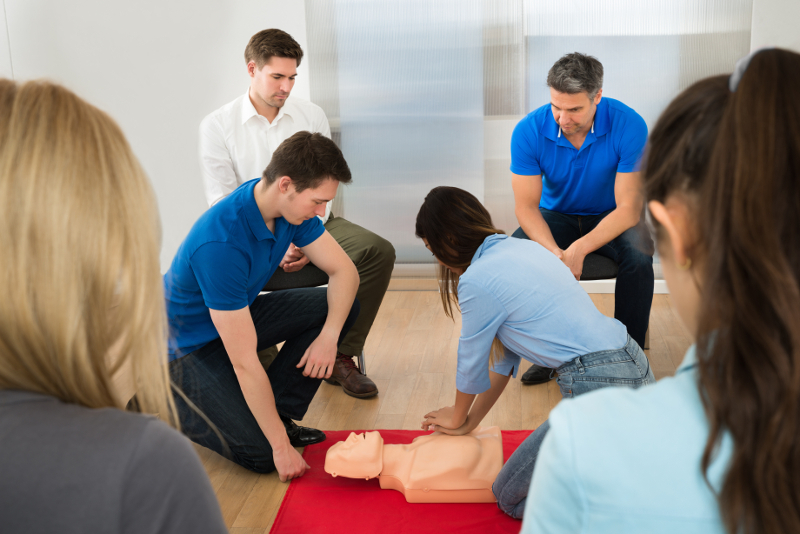 Adopting your own first aid and CPR training means you can ensure the program is current, effective, and focused on the requirements of your business. The major expense when opting for first aid training is the right provider and training course. The number of sessions and participants depends entirely on your workplace and number of employees. In order to cut costs, many companies will designate one or two employees on a floor or within a sector to receive the training. But if you consider the financial effects of workplace injuries – providing training for everyone will reduce accident numbers and severity – having greater financial impact in the long run. Employee morale is an integral part of any company. High morale leads to positive attitudes and positive attitudes leads to positive results. The happiness and wellbeing of your employees will help you build a strong relationship, ultimately resulting in a better working environment. 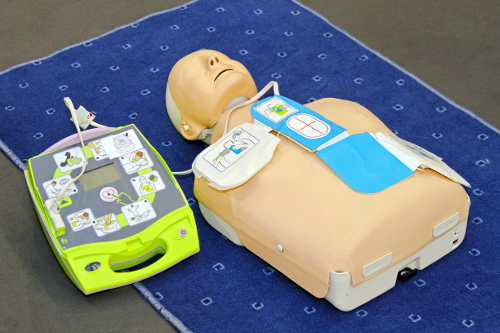 First aid and CPR training will help ensure employee health and safety in addition to enhanced wellbeing and morale. First aid and CPR save lives, particularly where there are grave injuries and it is critical that immediate action is taken. Training gives critical knowledge and confidence to effectively manage an emergency without fear or confusion. If you are based in Somerset and you are interested in an Emergency First Aid course at Lightning Training Solutions our team can help. We aim to deliver successful, efficient and cost-effective training to customers and clients across the surrounding areas. We’re committed to ensuring that this investment is made of the most of, whether you’re an individual or a company. What’s more is we take pride in making sure that we only provide the highest standards in every aspect of the services we provide. Sometimes people at work can suffer injuries or be taken ill, it doesn’t matter whether the injury or illness is caused by the work that they do or not, it’s important to give them immediate attention and call an ambulance is serious cases. First aid at work will cover the arrangements you need to make to ensure this happens, it can save lives and also prevent minor injuries from becoming bigger issues. Yes, all of our courses are suitable for beginners, you can also attend refresher courses should you need to. There’s no mandatory list for a first aid box, but deciding what to include should be based on an employers first aid needs assessment. We recommend stocking the following, sterile plasters, sterile eye pads, bandages, wound dressings and a pair of disposable gloves. Who is this course qualification suitable for? The course is suitable for businesses where there’s a higher risk of accidents happening, this also applies to industries like construction, forestry/tree surgeons and factories where chemicals are used. It’s also suitable for industries where there’s an imbalance between people on site and staff members, these situations may require a higher level of first aid. Information on first aid at work is available from the HSE, or you can call the team here at Lightning Training and we’ll be happy to answer any questions that you may have.